This annual event celebrates its 30th anniversary this year and it’s looking better than ever! Held at Ashton Court from the 7th to the 10th of August over 130 balloons will be attending the 4 day event. 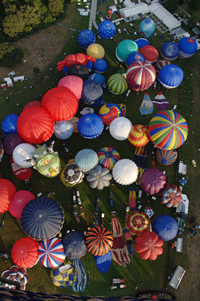 The fiesta is the second largest annual hot air balloon festival in the world. Spectacular balloons of all shapes and sizes attend every year to a crowd of over half a million during the four days. This year make sure you’re there on Thursday the 7th for the mass assent of the special shaped balloons, this will commence from 6PM onwards and will feature balloons from all four continents. The Red Arrows will also be making a display at the event. The 9 highly skilled R.A.F pilots will take to the skies on the Sunday (10th August) at 4PM onwards for a display guaranteed to amaze both the young and the old. As per normal expect to spot balloons throughout the skies of Bristol. Entry to the event is free, official parking however must be brought in advance, if you wish to park at the event then book now to be in with a chance of winning return tickets with Continental Airlines to New York, in the U.S.A.